History has not given the Smith & Wesson Model Two Army its proper place. At the time, Smith & Wesson was the Rolls Royce of its day of handguns, yet it seems to be mostly overlooked by today's collectors. The Model Two represented the cutting edge of a period that contained many innovations and ideas relating to the firearms industry. At the time, Smith & Wesson lead the handgun manufacturers into a new era, playing a great part in the history of the United States as well as many other countries. The key to the success of Smith & Wesson in the late 1850s and 1860s and the Model Two lies in the Rollin White Patent of 1855. Over the years volumes have been written on the subject, as it was indeed a key patent that shaped the direction of the firearms manufacturing industry. 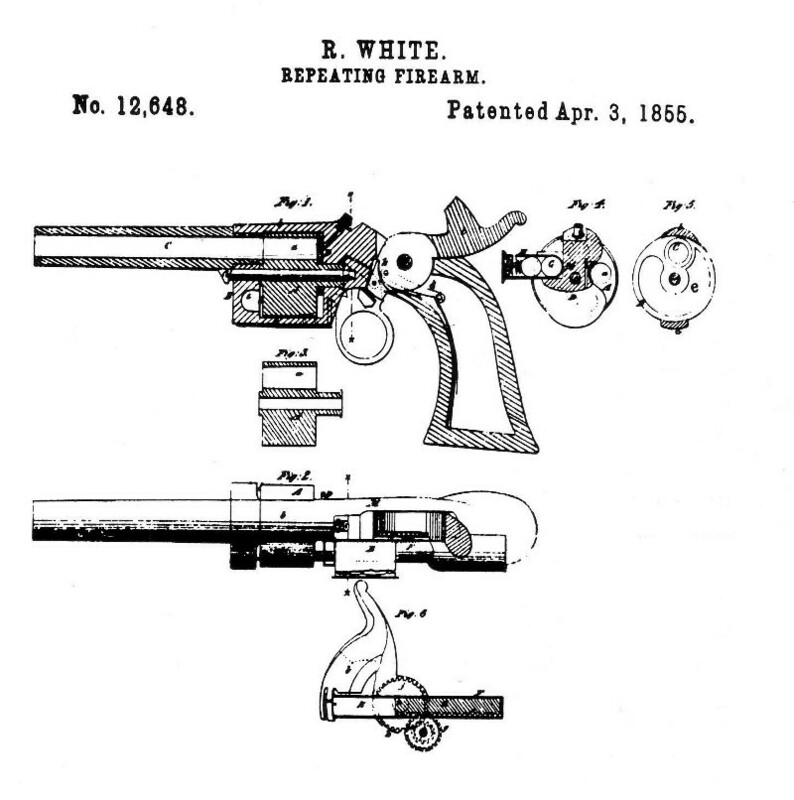 After obtaining the rights to the Rollin White patent on the bored-through cylinder, Smith & Wesson found itself in an enviable position with the exclusive patent on the ground-breaking cartridge revolver, featuring a self-contained cartridge - no cap, no wad, no powder, no ball, and no ramrod. This breakthrough drove the gun's popularity and demand. The Model Two Army was perfectly suited to the demands for a belt-sized pistol, which could be carried in the waistband or a small holster. It could be quickly loaded with the new waterproof metallic cartridge and proved ideal for the soldier as well as those on the home front. The timing was crucial, as the first guns reached the marketplace in June of 1861, only two months after the first shots were fired marking the beginning of the American Civil War. This was a time of dramatic turmoil, the likes of which American citizens had never experienced. Fear of invasion gripped the North, and Northern soldiers were searching for compact arms to carry to war. Orders rose so fast that by 1862 the company closed its order books, because they already had orders for more arms than they could produce in the next three years. From the military point of view, a major drawback to the model's use as a side arm was the small .32 rim fire caliber, which lacked the punch of the .44 cap and ball pistols. However, it certainly had the greater advantage over caliber pistols with the completely self-contained cartridge. The demand for this advantage made the Model Two Army an instant success, and by 1865 both Horace Smith and Daniel Wesson were each earning around $164,000 per year - the only six-figure income in the state of Massachusetts. This pistol has been referred to in several ways - Model Number Two, Model Two Army, and Model Number Two Old Army - with the original factory designation being Model Number Two. The word "Army" was added for its usage as a side arm during the Civil War. The designation "Model Two Old Model" was adopted by collectors after the Model Two .38 First Issue 'Baby Russian' became available. For the sake of brevity and consistency, in this study we will use the designation, "Model Two". Much speculation has been indulged in as to how the partners learned of a patent of April 3, 1855, issued to Rollin White, covering a revolver cylinder whose chambers were bored end to end. This feature was of course essential for loading rimmed metallic cartridges, although White himself had not conceived such ammunition. A likely theory attributes the discovery to checking the patent status of Lefaucheux pin-fire arms, imported into this country from France. That the said White, in consideration of the agreements hereinafter entered into by the said Smith & Wesson, hereby sells, assigns, and sets over, and has sold, assigned, and set over unto the said Smith & Wesson the sole and exclusive right to use that portion of said patent described in the schedule attached to said patent, in the following words: "consisting in extending the chambers through the rear of the cylinder for the purpose of loading them at the breech from behind, either by hand or by a self-acting charger from a magazine placed in rear of said cylinder,"? and that portion only of said patent, the said use of said patent to be held and enjoyed by the said Smith & Wesson, or either of them, for his or their own use, and his or their own use only, and not to be assigned or sold by them, to the full end of the term, for which said letters patent are or may be granted, as fully and entirely as the same would have been held and enjoyed by said White had this transfer of the use of said portion of said patent not been made. And the said White hereby covenants to and with said Smith & Wesson that he will, if judged expedient by the said Smith & Wesson, apply for and procure if possible an extension or renewal of said patent, at the termination of the term of years for which the same is granted, and pay all expenses of granting such renewal. And also that he will defend against and defray the expenses of any infringement of the said patent, so far as the portion, the use of which is hereby transferred, be infringed? And the said Smith & Wesson, in consideration of the agreements of the said White, hereby agree and covenant, and bind themselves to and with the said White, his heirs, executors, and administrators to pay to him the sum of five hundred dollars in cash, and furthermore, to pay to him the price or sum of twenty-five cents upon each and every arm to which said improvement or portion of said patent heretofore specified is applied, the amount of said bonus of twenty-five cents upon each arm to which said portion of said patent is applied to be paid to the said White, or his heirs, executors, or administrators, semi-annually, that is to say, at the end of each successive six months from the date of this instrument, and the said Smith & Wesson hereby covenant and engage to render to the said White just, true, and faithful accounts of the number of arms to which said portion of said improvement is applied? Rollin White, Horace Smith and Daniel B. Wesson signed this agreement, the witnesses being N. Shipman and John C. Parsons. It is of particular significance that the license granted, while sole and exclusive, was not assignable by Smith & Wesson that it lasted as long as the patent might be extended, and that White reserved no right to manufacture under the patent himself. He also agreed to apply for an extension if desired by Smith & Wesson, and to pay all expenses of obtaining a renewal or preventing infringements. After securing the Rollin White patent of April 3, 1855, the Smith & Wesson partners were able to place into production their early cartridge revolver. This seven shot .22-caliber revolver, termed the Model 1 First Issue, was produced in 1857. The early model was difficult to manufacture with its oval frame needing hand filing and the small side plate for assembly. To correct these points, the Model 1 Second Issue was designed with flat sides for ease of machining. Also, a large irregular side plate and a one-piece hammer were added, as well as improvements made in the cylinder stop. With production commencing in 1860, and in spite of its small size, the Model 1 Second Issue .22 caliber continued to be a best seller during the Civil War. It was used and given to military personnel as a "Personal" firearm or Pocket Model. In 1859 Smith & Wesson resolved this problem by incorporating a projection on the frame, behind the case to be fired, which would allow the swollen expended case to revolve free to a more open space. This projection was patented July 5, 1859. With this improvement and other design changes, the factory planned the upscale .32 caliber revolver to be called the Model Two. Production began in early 1861. It was similar in design to the Model 1 Second Issue, except it was a six shot made of forged wrought iron. It was designed to fire the Number 2 cartridge, known today as the .32 caliber rim fire. The Model Two was available in 1861 in both 5-inch and 6-inch barrel lengths, with a factory finish of blue, nickel or a nickel-plated frame and blued barrel and cylinder. In 1864 they added a 4-inch barrel and a target 8-inch length; however, very few of these were made. The Model Two was produced until 1874 with a total production of 77,155. The Model Two with a 6-inch barrel was the favored size for military use. Its popularity with Union soldiers was not limited to officers. Charles Scarett of the 16th Kentucky volunteers wrote that his pistol had killed two rebels. From Decatur, Alabama, N.B. Peterson of the 10th Indiana Cavalry reported that, "S&W revolvers are in great demand in this place." Corp. J.O. Sherwin wanted a dozen for his company in the 83rd Illinois and William H. Golder sought six for friends in the 8th Iowa Infantry. Within a single month in 1864, requests for price lists came from the 126th Illinois at Pine Bluff, Arkansas, the 3rd Wisconsin Veteran Volunteers at Atlanta, and the 115th Ohio at Murfreesboro. As for being the officer's favorite, Capt. Frederick Livermore, Massachusetts Volunteers wrote, "Most of our officers have your make." Capt. H I. Wheat, 11th Missouri Cavalry, considered the Model Two the "?best belt revolver I have seen," as did Major D.Frazar, 13th New York Cavalry." Special thanks to Marlan Polhemus for this background. Author's Note: Throughout the book we will be looking at certain aspects of the project through another person's eyes.